Iowa Governor Terry Branstad is not in favor of issuing driver’s licenses to people who are in the state illegally. The governor was asked about the issue surrounding a fatal accident in Des Moines. “It is a tragic situation that occurred on the south side of Des Moines. You had a person who was here illegally who was driving without a driver’s license. Was driving at an extremely high rate of speed in a residential area. The result is…. 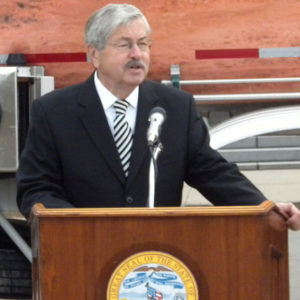 at least one has died,” Branstad says. Eighteen-year-old Fernando Lopez Aguilar was the driver in the accident which left 12-year-old Lea Phann dead and several others seriously injured. Lopez Aguilar faces several charges, including homicide by reckless driving. Democrat State Senator Matt McCoy says people in the country illegally should be allowed to have driver’s licenses. Governor Branstad does not agree. “We believe that everyone has the responsibility to obey the laws — and that’s whether it is the immigration laws or whether it is the traffic laws of our state,” Branstad says. Branstad says this accident is a tragedy for many people. “I feel for the victims who have suffered because of this, and I think it underscores that we as a state and as a country are a nation of laws, and we all have a responsibility to obey those laws,” Branstad says. Branstad says allowing illegal immigrants to get driver’s licenses is not the answer, and cites California as an example. “I don’t think doing what California has done…what has happened in California has not worked,” Branstad says. Iowa Senator Chuck Grassley, a Republican, sent a letter to the U.S. Homeland Security Director requesting the immigration history of Aguilar. Grassley says he is seeking details regarding when Aguilar entered the United States, whether he applied for immigration benefits, whether they were granted and if Aguilar was ever ordered to be deported. Grassley is also seeking information on his encounters with law enforcement, including criminal or civil arrests, charges and their results and whether he had any criminal gang affiliations.